I decided to resurrect and improve the following piece of Flash Fiction I wrote last year. A friend was wondering about what would one wish for in the event of miraculously having access to three wishes with no strings attached, within 200 words. I just had to make this interesting, with a little unexpected twist at the end. Word count is the most interesting way I know of slimming down a piece of writing to the bare bones. ‘Yes Master, I have given much thought to my final request, and I ask for a companion to share eternity with, I will get lonely on my own and I would love a special friend to share my life with. Then with a wave of the magic wand Roger was turned to stone. 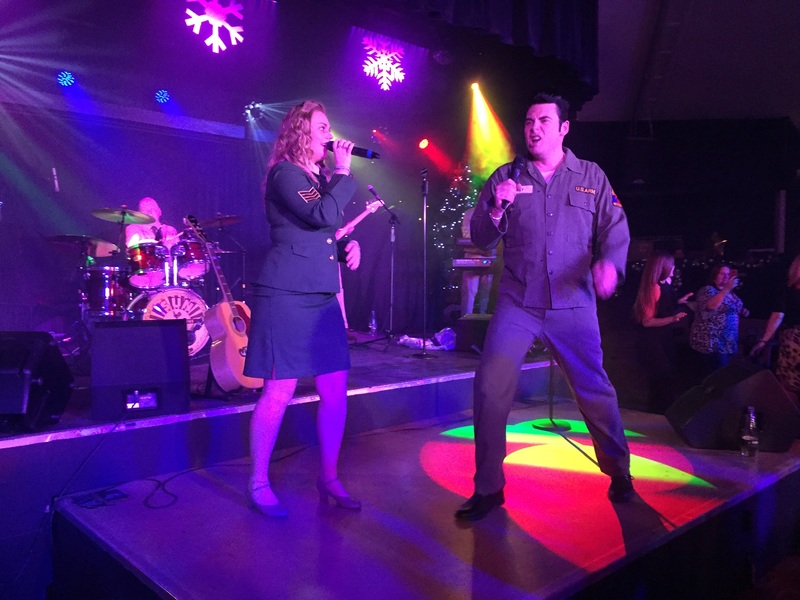 Mark Summers, the Elvis Presley, lookalike and sound-alike was magnificent, full of the energy and sophistication required to pull off brilliant renditions of legendary song after legendary song; bringing many pleasant dormant memories to life. The audience were mainly from the age that experienced these massive hits when they were performed by the great man himself. Mark Summers had his audience waving their arms in the air while singing along to the well-remembered words of these Elvis Presley classics. With the help of an attractive lady backing singer and the brilliant sounds of his backing group, the Memphis Sons. Margaret and I enjoyed this show enormously and we finished the evening dancing pleasurably to the music as this enigmatic singer performed the encores demanded by his smitten audience. Write a story based on an experience from your childhood — but have that experience happen to a person or group of people who are nothing like you or your family. When we were playing on our large playing field behind the school, we dug a large pit in the ground and put planks over the top and made ourselves a comfortable little den. We enjoyed our self-provided privacy in our own little world of dirt and worms and grassy comfort. One day a new pupil arrived from a well-to-do family and needed to be welcomed and looked after. “Yes Miss:” We all chorused. Later that day, Rodney Blenkinsop arrived and he was quickly christened, ‘Soppy,’ for short, by one and all in view of his high-brow manners and his total dismissal of all sports as a waste of time. Tommy was taken aback by this attitude and was about to thump him when Mrs, Simpson appeared. We all then made our way to our den in the field. The boys all chuckled loudly when they noticed the total look of horror on the face of Rodney Blenkinsop. We all piled underground and waited for the new boy to brave the dirt and mud at the entrance to our secure little den. The laughter became guffaws then turned to outright glee as everyone realized that Soppy was still outside the den. Then suddenly there was a shaking of the timbers on the flimsy roof, then a trembling of the earth around the den as the roof began to collapse. Somehow as the main beams began to fall inwards they were stopped in full collapse. “That’s Soppy’s voice,” said Henry as everyone dashed for the hole which collapsed immediately the last person escaped. The roof then caved in, taking Soppy with it into the bowels of the earth. Of course, he was rescued by a passing schoolmaster who had witnessed the whole episode. Rodney Blenkinsop soon recovered in the school sickbay, none the worse for wear. Just a few cuts and grazes as badges of his courage. No one ever referred to Rodney as Soppy again, From that day forward, he became something of a school hero. “Well Sir! I’m pleased to say there will be no charge for your meal. The manager has decided that in view of the extenuating circumstances, your meal will be free of charge. On the house!” said the waiter respectfully. “Call the manager here at once; it is not good enough to waive the charge. I think you have recognised me as an undercover inspector charged with rooting out unhygienic premises and publicly highlighting the dangers.” replied the man in the grey suit. Almost immediately a breathless manager charged up to the guests table, looking extraordinarily flustered. was having and was now smiling gleefully. At that moment another diner interrupted the conversation and addressed the manager directly. “I think there has been some mistake. Charge my meal to this card please: I have an urgent appointment. Take an extra £50 to cover this unfortunate situation and I will be on my way.” the man spluttered, clearly flustered at this turn of events. The manager quickly accepted the card and charged the meal. The manager smiled and returned the card to the diner. Grinning broadly he said to him. “Father, I have a plan, a brilliant plan that involves a mathematically infallible system I have worked out how to break the banks of all the major casinos in this country. I have spent the last two years working day and night on this system. It is an unbreakable chain of numbers that will certainly get what I want. Philip’s father’s, angry, shocked, face revealed his feelings. Philip looked strangely nonplussed by this reaction, “Father I am sorry you feel this way, I was sure you would help. I have already approached a firm of unsecured lenders to raise money to test the system, and it really works. I have paid them back their loan with a huge sum of interest. I thought you would welcome the chance for our family to be unimaginably wealthy. I would use the initial winnings to invest in the stock market and we would have more than enough to enjoy life to the full. Philip smiled as he left the house that day, never to return in his parents lifetimes. He became extraordinarily wealthy by using his system and diversifying the winnings, thus defeating his craving for limitless wealth. Sadly another craving slowly took over his life, as he craved the excitement of the turn of the cards. The unbreakable system proved to be as fallible as his Father had predicted. Ah! But that’s another story. 271. Patterns: Write about repeating patterns that occur in life. Patterns: Write about repeating patterns that occur in life. Tom looked hard at that sentence on the wipe board. Walter, commonly known to one and all as the Swot, scratched his head vigorously. Rumour had it, the more vigorously the swot scratched his head, the less likely it was that he would come up with an answer. “Hmm! That seems like a broad interpretation of the question, Swot. Surely there are no visible patterns that occur, I mean. How about birth? There are so many ways a person can be born into this world, surely you will never form a pattern out of birth?” Tom said, more puzzled than ever. Walter grinned wickedly and gently remarked to Tom. “I think I see a certain pattern of behaviour when I observe the good Mr. Shepherd, teasing his lambs, by leading them to intellectual slaughter. A habitual pattern of events that occurs with annual regularity. In the Clouds: Go cloud watching for the day and write about what you imagine in the clouds. Peter and Pauline had climbed to the top of the steepest hill in the district, Old Tom’s Tor, the view from the peak was stunning, fields, mountainous valleys, and verdant green forests spread out before their eyes. Peter flattened himself on the soft green grass and lay back, enjoying the opportunity to rest in the glorious sunshine. Pauline laughed and joined him on the ground. ‘This grass is so soft and comfortable we will have to be careful we don’t fall asleep in the warmth of the sun, look at the colourful wildflowers growing unruly and freely all the way down the steep slopes: Beautiful!’ said Pauline. ‘I thought you would never ask.’ laughed Pauline.